FUMC Mabank is one body with many hands! Much of the work we do day in and day out is not possible without the help and assistance of the laity of the church. If you have a calling to help in the church, here are just a few ways you can help, no matter the age. Acolytes are a special part of the Children’s Ministry at FUMC Mabank. Every Sunday, children (3rd-5th grade) trained as Acolytes are allowed the opportunity to join in the celebration of the service by bringing the “Light of Christ” into the sanctuary and lighting the altar candles. They will fill any other necessary roles as children’s leaders for the day; and at the end of the service, Acolytes will lead the church out from the sanctuary into the world with the “Light of Christ” going forward with them. Your gifts as a vocalist or instrumentalist are always welcomed in service of worship. Find out more information by contacting Aaron Strum. If you have a love of decorating, there are opportunities throughout the year where you can help decorate the church in preparation of special Sundays or events. If you have this gift and would like to share with the church, please contact the church office. Audio and visuals are an intricate part of our worship services. If you are technologically savvy or have a love for technical work like sound balancing and computer graphics, A/V Tech is a wonderful way for you to share your gifts. If you are interested in doing technology service but do not have much knowledge, we will gladly help you learn. Please contact Kelly for more information. All prayer requests received at the church are prayed over daily by the Agape Prayer Group. If you have a heart of prayer for others and wish to serve in prayer, please contact the church office. We provide “Prayer Blankets” for anyone in need when requested by a FUMC member. The blankets are made, placed in the sanctuary for members to pray over and tie a knot (signifying their prayer), and then presented to the person who was in need — hospitalization, illness, accident, death, armed services personnel, etc. This group meets the 4th Saturday of every month and would appreciate your volunteer and supplies efforts. 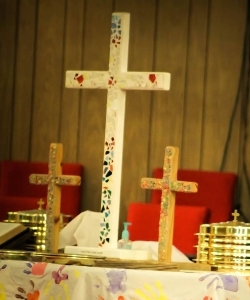 Prayer Crosses are made by request and then presented to the person who is in need — hospitalization, illness, accident, death, armed services personnel, etc. If you have a friend, family member, or neighbor you feel could use a Prayer Cross, please let the church office know. Do you enjoy helping others both in and outside of our membership, working one-on-one with those in need? We are laypersons trained to provide one-on-one caring support to those going through a stressful time in their life. Grief support, hospital visitation, nursing home and shut-in visitation, prayer ministry, and financial counseling are all offered. Your service will be appreciated and remembered by those you serve! Started in 1995 as a fundraiser for the youth ministries, Lord’s Acre has grown to become a successful tradition of FUMC Mabank and an iconic weekend for the Mabank Community. Annually, on the second Saturday of October and the week leading up to it, you will see a giant tent set up in the church parking lot. Thursday evening kicks off the celebrations with Gospel Singing. On that Saturday, there is a festival of activities that includes a country store, barbecue lunch, and live auction. Sunday morning, we join as a church family under the tent for youth lead worship and reflections. This is a special time for our church, and we invite you to join us in celebration and service. Do you have superb organizational skills? Can you cook? Make craft items? Sell items? There is a place where you can join our church family in service and help support our youth ministries. If you are great at organizing chaos and pricing/selling items, then this mission is for you! Every 3rd week of March, members give all their unneeded goods (except clothes) to the church to be sold to everyone in our community. The money raised in efforts like this fund many of the mission projects and services of the church. The garage sale also gets people to and into our church, exposing them to the wonders of our love for each other the love of Jesus Christ. What is summer without a week of fun, Bible stories, music, dance, crafts, and games?! All of these fit the description of what Vacation Bible School is all about! If you love to do any of the aforementioned, especially having fun and loving children, then VBS is a wonderful way to celebrate our God and teach the Bible stories to the children of our church and the community! Sometimes the call to service leads us to see a greater call in our lives. FUMC Mabank and The United Methodist Church provides ways to assist you in your calling for spiritual leadership. Assisting in the leadership and spiritual development of children through adults is an essential part of everyone’s growth and development. We pray that all feel a called to participate in this form of service. If you are interested in serving and feel called as a teacher, please visit with Pastor Dan Gurley about ways you can serve in spiritual development. By completing a Basic and an Advanced course offered by Lay Servant Ministries of the North Texas Conference, lay persons can discern more about God’s call on their lives, and be prepared to effectively use their Spirit-given gifts to serve the local congregation and beyond, through a variety of ministries in Caring, Leading, and Communicating. For further information, visit the Lay Servant Ministries website or contact the church for more information.